There’s still time to bid a fond farewell to the Greenfield Bridge, which closes Friday night in preparation for a total overhaul that will result in a new steel bridge in the long-term, but will mean detours and traffic headaches in the area in the near future. 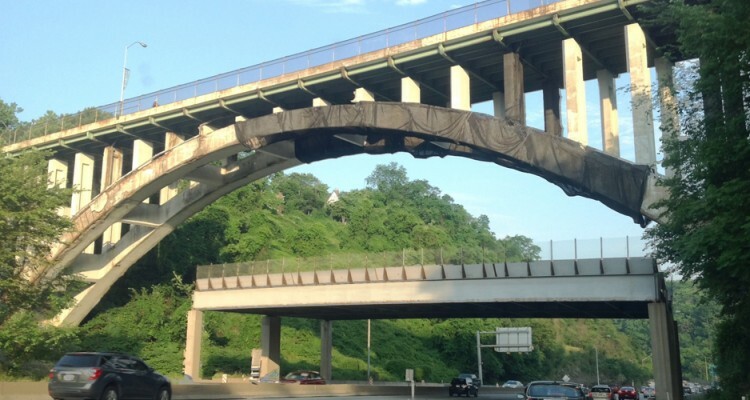 The 94-year-old bridge, which spans the Parkway East, will be imploded in December as part of a $17.5 million reconstruction project that will last for 18 months. The bridge has been in disrepair for several years. 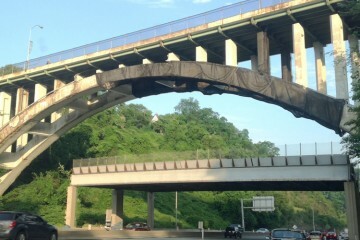 Its most recent update was back in 2004, when netting was installed underneath the bridge to catch chunks of concrete before they fell on the Parkway East below. On Tuesday, the city announced plans for the various detours the project will require. Pedestrians and cyclists will be restricted from the bridge beginning at noon on Sunday, and can either use the Junction Hollow Trail, accessible from the Alexis Street steps or Saline Street on the Greenfield end, and Joncaire steps or Joncaire Street in Oakland. Bus routes including the 52L Homeville Limited, the 53L Homestead Park Limited, the 58 Greenfield, and the 93 Lawrenceville-Oakland-Hazelwood have already been rerouted. Restrictions to the Parkway East will vary, and will be posted in advance, but the roadway will definitely be closed between Dec. 26th and Jan. 3rd, during the implosion. The city and the Oakland Transportation Management Association have set up a website to provide updated information to the public, and answer questions. The Greenfield Community Association is sending the 446-foot tall bridge off in style, with a Bridgefest party planned from 4 p.m. to midnight Saturday. The event is intended to let people know that businesses in Greenfield are still open and accessible even though the bridge will eventually be gone. “We want to encourage people when they’re stuck in traffic, and they will be stuck in traffic, to stop in at some of our local businesses,” O’Connor adds. The party will feature music by NOMaD, Milly and Joe Grushecky and the Houserockers, as well as a raffle to determine who pushes the plunger when it’s time for the implosion. O’Connor says the next year and a half will be an adjustment, but that the project will ultimately be a positive step for the neighborhood and the city.